Color image from the Curiosity rover showing part of the wall of Gale Crater. (A) Curiosity has 6 wheels, each half a meter (20 inches) in diameter, and a maximum speed of about 4 cm/s. 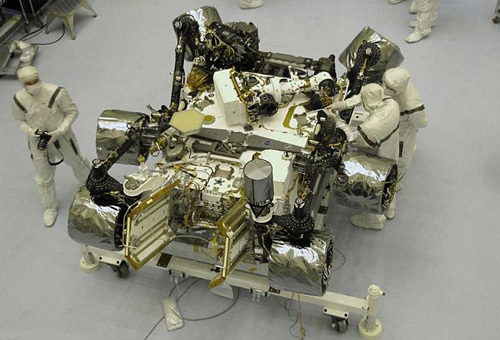 (B) The rover has 17 cameras for identifying and imaging targets, and a laser to probe the makeup of rocks. (C) Other instruments, attached to an arm, including a microscope, are available for close-up investigations. (D) Samples drilled from rock, or scooped from the soil, can be delivered for analysis to two miniature labs inside the rover. (E) Data are sent to, and commands received from, Earth via antennae on the rover's deck. Artist's impression of Curiosity on the surface of Mars. Curiosity under going final preparations and being checked out by technicians. 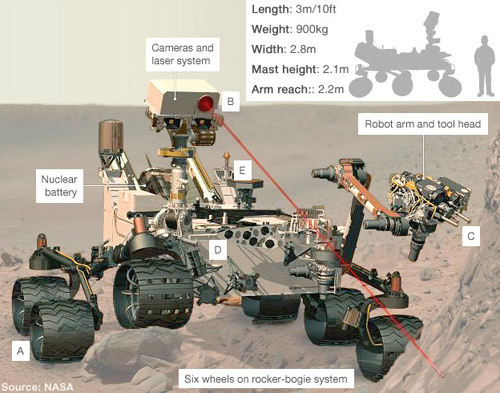 The 2.5-billion-dollar Mars Science Laboratory (MSL) is the latest and most ambitious of NASA's lander missions to Mars. MSL launched on November 26, 2011, and landed safely on the Red Planet on August 5, 2012. Its centerpiece is the largest rover ever placed on another world – a long-range, long-duration, car-sized vehicle called Curiosity. Curiosity isn't designed to search directly for any possible life on Mars but rather to determine the habitability of the Red Planet, i.e., whether Mars ever was, or is still today, an environment capable of supporting at least microbial life. 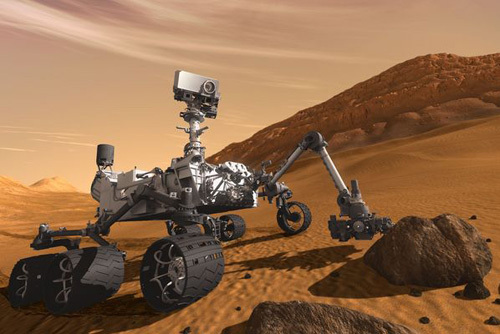 Curiosity is also the first 'smart lander.' As such, it pioneered and tested new technology for autonomous operation, such as an accurate landing and hazard avoidance system aimed at reaching what may be promising but difficult-to-reach scientific sites without continuous guidance from Earth.  long-range mobility on the surface of the Red Planet (5–20 kilometers or about 3–12 miles) for the collection of more diverse samples and studies. Curiosity is twice as long and three times as heavy as the Mars Exploration Rovers and is the first spacecraft to land directly on its wheels. Having descended most of the way through the martian atmosphere by parachute, Curiosity was lowered to the ground by a Skycrane – a frame that carried propellant tanks, as well as two 'outriggers' each equipped with a set of 700-pound-thrust rocket motors. Having maneuvered above a suitable landing spot, the Spaceframe released the rover, which slid gently down a tether from a height of about 5 meters. It will next deploy a suite of instruments with 10 times the mass of those carried by either Spirit or Opportunity and powered by a nuclear battery. Curiosity is expected to operate for at least one martian year, or roughly two Earth years. Curiosity has landed in an enormous crater, called Gale Crater, which measures 154 kilometers (96 miles) in diameter and is thought to be between 3.5 and 3.8 billion years old. Over the next couple of years it will be investigating the tall central peak of the crater, known as Mount Sharp, which rises some 4.5 kilometers (15,000 feet) above the southern floor, and whose perfectly preserved layers of sediment, undisturbed by plate tectonics and other disturbances of the kind found on Earth, will, geologists, hope reveal much of the history of this part of Mars. Mount Sharp appears to be a remnant of sedimentary layers that once filled the crater completely, possibly originally deposited on a lake bed. 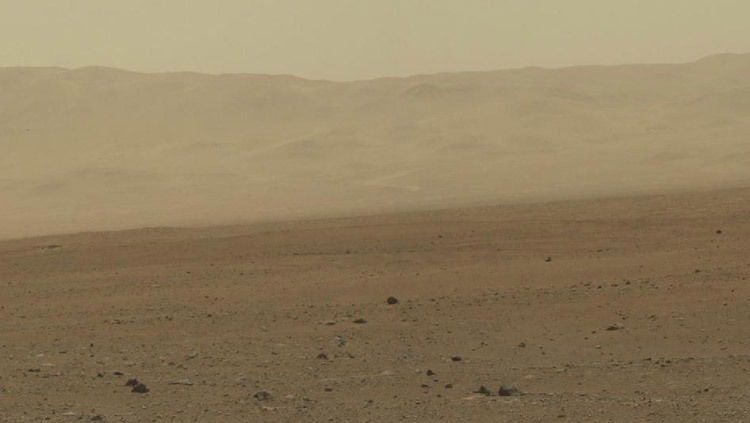 One of Curiosity's main goals will be to explore the layers of the central peak and rocks on the surrounding plain to look for evidence of the role that water played in shaping the landscape and how long water may have persisted on the surface – a key factor in assessing the chances that life may have developed here.